Pricing is the biggest lever a business has to drive profitability. For money transfers, consumer behaviour is strongly influenced by the price of the service (the price being a combination of a provider’s fees and FX margin). Our new optimal pricing analysis (unveiled below), shows major UK banks and providers are almost never correctly pricing to maximize profits. Put simply, most of the industry is leaving vast amounts of profit and value on the table. We have anonymised the charts below, but all analysis is based on current individual bank and payment company real pricing structures. 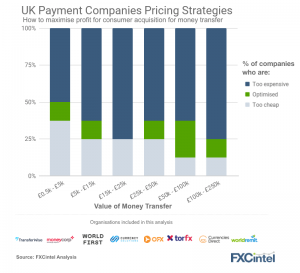 Across the range of transfer amounts, the majority of payment companies are too expensive. This means they could lower prices, win more customers and make up for the loss in per customer revenue through increased volume. In other cases, companies could actually increase their margins without significantly affecting their acquisition rates. 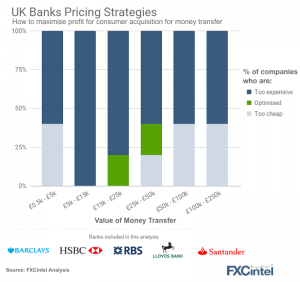 As for banks … Banks are similarly failing to optimise their pricing structures on both ends. Perhaps surprisingly, a significant number of banks are actually pricing lower than they need to. Big. Take for instance company X. Currently they have a margin of 0.6%, and out of every 10 possible new customers they acquire 4 and make $24m (off a volume of $4bn). However, they have not optimized their margins to maximize their revenue (turnover). It turns out given their standing in the market, and the standing of other players in the market, they could increase their margin and make more money (from less customers). If they increase their margin to 0.9% they can maximize their revenue. They now take only 3 customers out of every 10, but they make $27.0m (off a volume of $3bn), all straight to the bottom line. What does that do to the valuation of your business? Pick a multiple and apply that to the millions of extra profit. Our model helps solve a widespread problem among payment companies – the lack of data on customer behaviour. Every company has the opportunity to analyse behaviour of their own customers, but every company’s data is biased (as they are looking only at customers who selected them). No amount of A/B testing on your own customers can negate this bias. To overcome this, we’ve built our model off our own proprietary dataset, which we’ve gathered over many years across our group. This data includes customer behaviour across multiple providers, and gives insight into real consumer preferences and selection behaviour in the money transfer market. We’ve taken this data and used machine learning methods to understand how different pricing structures influence customer behaviour and on-boarding. This in turn allows us to find the optimal price payment companies should charge, across different transfer amounts. The charts above are based on the use of our model to find margins to maximising profit. Our model can also be optimised for customer acquisition or any combination between more profit and more customers. Our optimal pricing analysis is part of our FXC Intelligence portal, providing organisations the possibility to finally answer the question “what is the optimal margin” to maximize our profits? Get in touch with us.